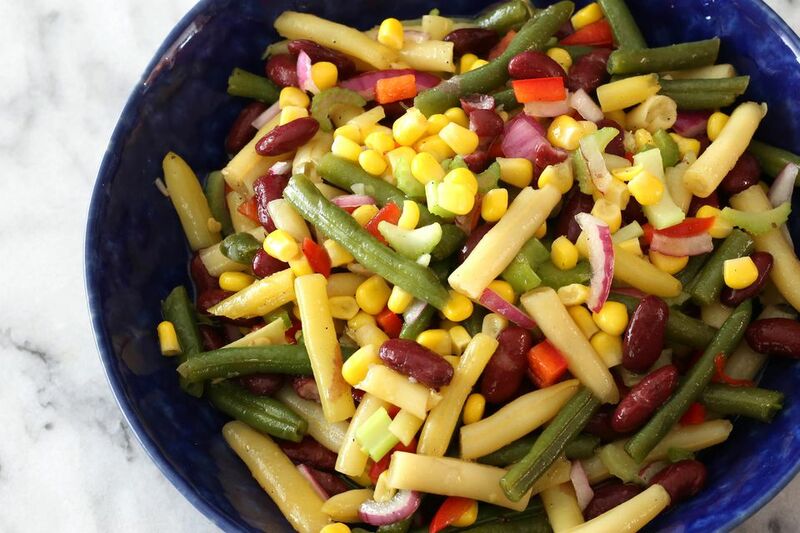 Here's a sweet and sour marinated corn bean salad, great for cookouts or any occasion, and very easy to prepare. Most of the ingredients are pantry staples, with the exception of the fresh bell pepper and sweet onion that really give it a nice crunch. Feel free to use black beans or another kind of bean instead of kidney beans. The salad is a good starting point, and you can change ingredients to suit your taste. Add an extra variety of beans along with the kidney beans or replace the kidney beans with black beans, great northern beans, or pinto beans. Shredded carrots can be added for extra color and crunch, or add some fresh diced tomato just before serving. Feel free to make your own changes to this versatile bean salad. Place the drained beans, corn, and chopped vegetables in a large serving bowl. Whisk together the oil, vinegar, salt, pepper, and about 1/3 cup of sugar; pour over vegetables. Toss to coat well. Taste and add more sugar if a sweeter salad is desired. Cover the salad and refrigerate it overnight or at least 4 hours for the very best flavor.